Adventure Capital seems to have been written for the big screen... or maybe an award-winning TV series. Anyone who has ever done business in South Florida will understand why. Scenery, setting, night life and the Hi C's of Crime, Capitalism and Corruption are prevelant everywhere. Pretend it isn't real, as author and retired university business professor John Rushing once tried to do. 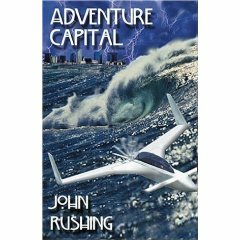 Based on a true story, Adventure Capital is a thriller from start to finish. Engineer and entrepreneur Mark Hansen is determined to carve out his destiny as the manufacturer of an innovative locator device for finding people lost at sea. After a jealous business competitor fired six 9mm hollow point bullets into his office, Rushing knew he had a lot to say about the adventure of being an entrepreneur in Fort Lauderdale. "This book is like Dave Barry meets Tom Peters at Daniel Steel's place." "I took the book home, my husband devoured it--I'm shocked, he never reads!" "A business lesson, without the pain, a love lesson with the pain-- who knew?" "The writing equivalent of shooting the curl."